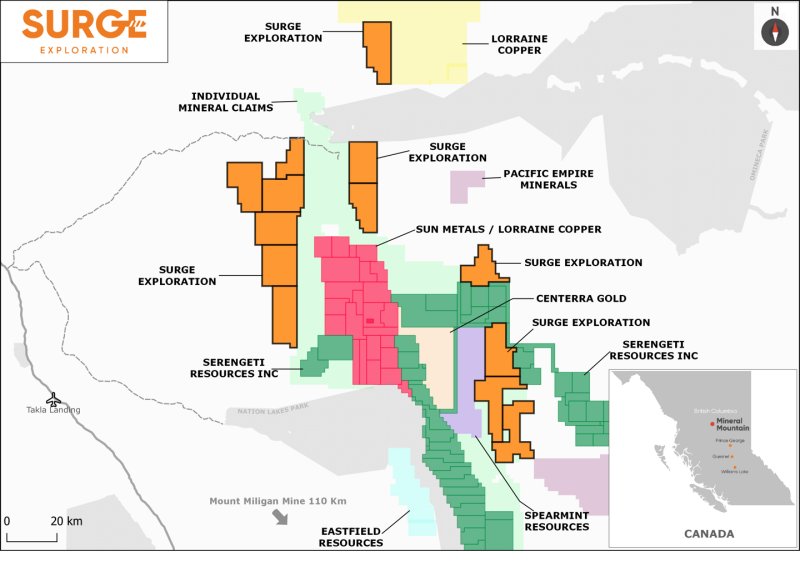 Vancouver, BC / TheNewswire / February 12, 2019 - Surge Exploration Inc. (the "Company" or "Surge") (TSX-V: SUR, OTCQB:SURJF, FRA: DJ5C) is pleased to provide an update on various corporate activity nearby its Mineral Mountain gold-copper properties in the Omineca Region of British Columbia, as well as, providing interim assay results from drill holes GB18-22 to GB18-30, drilled on its Glencore Bucke Cobalt Property (Cobalt, Ontario, Canada). Prominent among early discoveries in British Columbia's Omineca region were the nearby Lustdust/Stardust property (Sun Metals Corp. TSXV: SUNM) covering a large, coherent integrated porphyry-skarn, epithermal system; the Kwanika property (Serengeti Resources Inc./POSCO Daewoo TSXV: SIR) a promising advanced stage copper-gold project; the Lorraine property (Lorraine Copper Corp. TSXV: LLC) host to a large copper/gold NI 43-101 compliant resource. The tenures are located between the Kemess North project being developed by Centerra Gold Inc.'s (TSX: CG) subsidiary Aurico Metals and Centerra Gold's current mining operation - the Mt Milligan mine. On January 19, 2019, Centerra Gold Inc. announced that the Mount Milligan Mine (located 110 km from Mineral Mountain) produced 194,993 ounces of Gold and 47.1 million pounds of Copper during the calendar year of 2018, and gave guidance for 155,000 - 175,000 ounces of Gold and 65 million - 75 million pounds of Copper for the calendar year 2019. Centerra Gold has calculated that the Mount Milligan Mine has proven and probable reserves of 5.8 million ounces of Gold and 2.1 billion pounds of Copper and has estimated Mount Milligan to have a 22 year mine life. - GB18-26 0.29 % Co over 0.25 m from 79.25 to 79.50 m.
- GB18-27 0.47 % Co, 33.1 ppm Ag, 0.82% Cu over 2.33 m from 94.42 to 96.75 m, including 1.3% Co, 65.8 ppm Ag, 0.97% Cu over 0.83 m from 94.42 to 95.25 m.
- GB18-29 1.28% Cu over 3.75 m from 61.75 to 65.50 m, including 0.24% Co, 0.43% Cu from 63.00 to 63.40 m.
- GB18-30 0.70 % Co over 0.50 m from 40.00 to 40.50 m.